I finally gave up on persuading the hamster to bed down in the Big Hut and let it have its dacha in a far corner. Almost two weeks had passed, and Francois still deplored everything about us except our foreign aid. One morning I came down and heard it making dreadful squeaking noises that I was sure were symptoms of hamster pneumonia. I dragged the uncooperative hamster out of its nest, but the squeaking noises in the nest continued. I lifted up the shredded paper. "Oh, my god," said Ted. "It's a Francoise." Now I knew what the store clerk had meant by sociable. 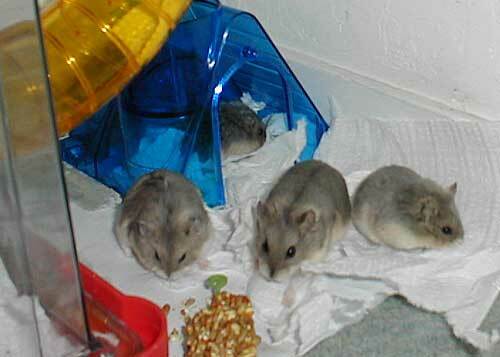 A newborn dwarf hamster is no bigger than a lima bean. If I had seen one in the wild, my first impulse would have been to kick dirt over it. It looks like a hairless pink slug with nasty wiggling appendages. I hurriedly put the paper towels back over them and let Mama go. "We are not running a hamster ranch," Ted clarified. 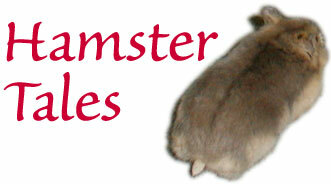 I went back to the hamster web site. 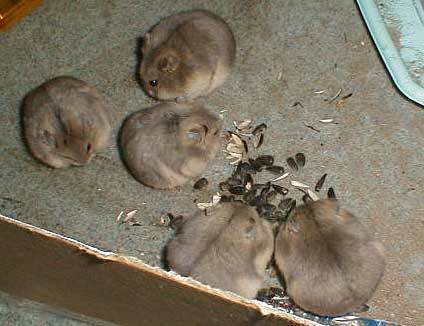 I learned that baby hamsters take about six weeks to wean. (And when do they become fertile? Probably after six weeks and a day.) Their gestation period is eighteen days. If I took a laissez faire attitude, we would soon be up to our heinies in hamsters. I promised Ted that I would get rid of the babies after they were weaned. The hamster site suggested that I augment the mother's milk by blenderizing a cucumber, dry milk powder, and wheat germ. I blindly dropped small spoonfuls of the glop into the nest, hoping not to concuss anyone (although later I realized that it is impossible to addle a hamster brain). The kids became mobile in about three weeks. By that time, they had hair and had turned into miniature dwarf hamsters, which is about as small as anything can get and not cross over into the insect world. "Aw, look at them..." I said to Ted. "We are not running a hamster ranch," he insisted.